Korea Observer: What time is it? It’s 2PM! When Korean agency JYP Entertainment announced last January that boy band 2PM would be holding its first-ever concert in Manila, Filipino fans were thrilled that their dream to finally see the boys in person would soon come true. Since its debut in the Korean music scene in 2008, 2PM has grown to become one of the most popular Korean artists in Asia, buoyed by hallyu, or the Korean Wave, that has swept many countries around the world. Composed of Taecyeon, Nichkhun, Jun.K, Wooyoung, Junho, and Chansung, the group has charmed thousands of fans in various countries with their talents, good looks, and hot bodies. And young Filipino fans are no exception. Thanks to the internet, the K-pop fandom in the country has grown big in the last five years. Social media sites including YouTube, Facebook, and Twitter have driven up the popularity of K-pop among Pinoys despite the language barrier. Currently, there are about 65 affiliated K-pop fan clubs with the Philippine K-pop Committee Inc. (PKCI), the umbrella organization of K-pop fans in the country. PKCI holds the Philippine K-pop Convention every year for all fans. For 2PM fans, collectively known as the “Hottest,” the Manila concert was the most opportune time to show their love and support for the boy band. 2PM fan clubs and groups in the Philippines have been in existence for years. Some of these fan clubs or support groups were the 2PM Philippines, 2OneDay Philippines, Hottest Philippines, It’s 2PM Hottest., Nichkhun PH, Chansung PH, Junho PH, Taecyeon PH, Jun.K PH and JangWooyoung PH. For the concert, they started planning projects as early as January. Their preparations included fan chants, light sticks, banners, fans, and other projects that would be used during the one-night-only concert. When the Korean boy band arrived in Manila last March 1, many of them trooped to the Ninoy Aquino International Airport (NAIA) to give them a warm welcome. From the airport, other fans followed the Korean stars to the hotel and patiently waited for hours just to get a glimpse of their idols. One of them was Imer Grace Campo from Paranaque who went to NAIA and the Manila Hotel to see the boys. She said she's a fan of Taecyeon whom she described as hot, handsome, and kind. 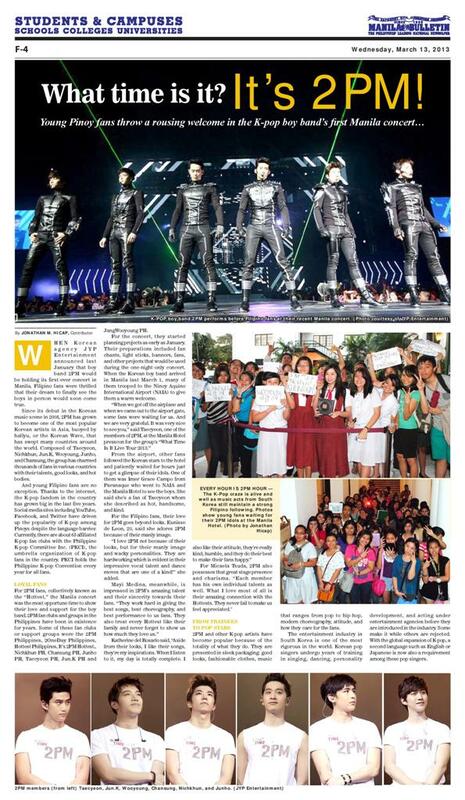 For the Filipino fans, their love for 2PM goes beyond looks. Eunisse de Leon, 20, said she adores 2PM because of their manly image. “I love 2PM not because of their looks, but for their manly image and wacky personalities. They are hardworking which is evident in their impressive vocal talent and dance moves that are one of a kind!” she added. For Micaela Tsuda, 2PM also possesses that great stage presence and charisma. “Each member has his own individual talents as well. What I love most of all is their amazing connection with the Hottests. They never fail to make us feel appreciated." 2PM and other K-pop artists have become popular because of the totality of what they do. They are presented in sleek packaging: good looks, fashionable clothes, music that ranges from pop to hip-hop, modern choreography, attitude, and how they care for the fans. The entertainment industry in South Korea is one of the most rigorous in the world. Korean pop singers undergo years of training in singing, dancing, personality development, and acting under entertainment agencies before they are introduced in the industry. Some make it while others are rejected. With the global expansion of K-pop, a second language such as English or Japanese is now also a requirement among these pop singers.